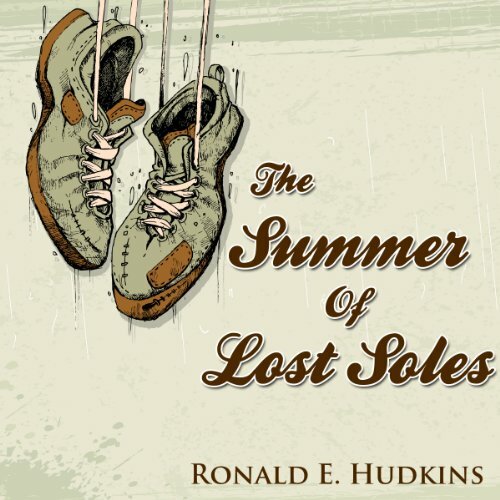 The book Summer of Lost Soles, by Ronald E. Hudkins, follows a youth named Ricky and his friends through their preteen 1960’s summer vacation mishaps. It seems Ricky has a somewhat known reputation for not being able to keep from destroying, losing, or misplacing every pair of shoes that are destined, rumored, indicated, or even actually placed upon his feet. He has a devious scheming sister who lives to get him in to trouble. His parents are at wits end to keep him in shoes. His friends aren’t any help at all in helping Ricky preserve his footwear be it by their pranks or everyday antics where stuff ultimately happens. Pretty much at the end of their ropes Ricky’s parents only request was for their son’s promise to have at least one pair of shoes ready and able to be worn to school at the end of what they knew was going to be a long hot summer. Their demanded stipulations were the shoes had to be more than a pair of shoelaces wrapped around his ankles. The shoes had to contain all the eyelets. They had to have an upper canvas casing that covers both feet completely. The soles had to be attached to the canvas as designed. The bottom of the feet could not be seen and exposed to the pavement below. Basically the shoes had to be a normal, unabridged, completely assembled presentable pair of footwear. They did not have to be pristine as some average wear and tear was expected. The satellite requirement of having just one pair of shoes by school time did not mean he was allowed to be barefoot the first or last half of summer. Although they threatened to send him to school during winter storms in his bare feet, Ricky did not believe for a minute that would happen. Just in case it could happen, Ricky did commit himself to the promise to have one pair of shoes (perhaps more) capable to carry him off to his first year of junior high school.